Hurley® is a durable dog toy, that’s shaped like a bone and meant for chewers. B?mi® adds a fun twist to fetch and tug-o-war with an innovative “S” shape that flexes out to twice its length. Tux® is a stuffable, guaranteed tough dog treat toy! 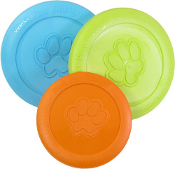 A durable dog toy that's meant for seriously strong dogs! Zisc® is a durable, floating dog frisbee that goes the distance. Perfect for games of fetch!